Saudi Aramco combines its substantial knowledge and insight to develop some of the most advanced technologies in the world to assist it in finding additional petroleum reserves – and to maximise the recovery of these resources for the benefit of this generation and the generations to come. Over the years, its expertise in managing its resource base has garnered global trust. To continue earning that trust, Saudi Aramco will invest significantly over the next decade across all areas of its business. The bulk of this spending will be in its upstream activities to ensure Saudi Aramco maintains adequate spare crude oil production capacity to help stabilise the world oil market whenever disruptions occur. The company is committed to making key advances in areas such as reservoir management that will strengthen its ability to reliably meet the needs of its customers while also bolstering the long-term efficiency and sustainability of its operations. 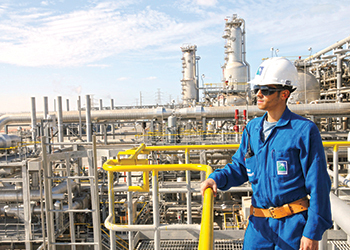 From the Arabian Gulf to the Rub Al-Khali, 2014 saw Aramco maximising the impact of its resources in a number of ways. The company’s average daily crude oil production in 2014 was 9.5 million barrels per day (mbpd) and Saudi Aramco exported a total of 2.5 billion barrels to customers around the world. It also worked toward its goal of significantly increasing its gas production, says Saudi Aramco in its 2014 Annual Review. In 2014, Saudi Aramco processed 11.3 billion standard cubic feet per day (bscfd) of raw gas, an increase of nearly 3 per cent compared to 2013. All of the increase in its gas production was from nonassociated gas reservoirs. The company’s growing gas production capacity will ensure that Saudi Aramco efficiently meets the kingdom’s rising energy demand with gas for power and industry while also meeting the global call on its crude oil. Aramco’s exploration programme discovered eight new fields, the most in its history: five gas fields, Abu Ali, Faras, Amjad, Badi, and Faris; two oil fields, Sadawi and Naqa; and one oil and gas field, Qadqad. This brings its total number of discovered fields to 129. Saudi Aramco completed a number of offshore wells in the Red Sea, giving it a deeper understanding of the hydrocarbon systems and potential resources in this region. The company’s better appreciation of the kingdom’s resource base is instrumental in enabling it to book new recoverable reserves to replace all of the oil Saudi Aramco produces with the long-term goal of growing the kingdom’s resource base. Saudi Aramco has made good progress toward meeting this target over the past decade. At the end of 2014, the company’s crude oil and condensate reserves stood at 261.1 billion barrels while natural gas reserves registered 294 trillion cubic feet, both all-time record highs. The molecules in these resources, and the opportunities they provide it to make lasting positive impacts at home and around the world, are the foundation of everything Saudi Aramco does. Saudi Aramco is an explorer at heart, always searching for new frontiers. At Saudi Aramco, a new frontier can be exploring a new geographic area, creating a new technology, entering a new partnership, or enabling new opportunities for the people of the kingdom. The foundation for all of these endeavours is the exploration for petroleum. Seismic, and specifically land seismic, is a centre of excellence in Saudi Aramco. Saudi Aramco has developed and deployed more intelligent acquisition and processing methods to improve the clarity and resolution of seismic data. The company’s seismic acquisition and analysis is being integrated more with electromagnetic and high-resolution gravity sensors, especially for subsalt imaging and in areas of complex geology. Saudi Aramco has programmes working to meet its long-term target of improving vertical seismic resolution to 5 feet at depths of 15,000 feet within four to five years. The company continued exploring the frontier deep waters of the Red Sea. Known as an extensional rift, the Red Sea represents a new geologic environment for it. Saudi Aramco has completed acquisition of essential data onshore and offshore to guide its future exploration. The company continued its research into the usage of autonomous underwater vehicles (AUVs) to conduct seismic data gathering in shallow waters. The navigation and positioning software elements were evaluated and tested in Europe using actual sea conditions. Additional work included the design and evaluation of the optimal AUV shape. Deploying AUVs for offshore seismic work offers the prospect of substantially reduced costs and time while also providing enhanced subsurface imagery. Long term, Saudi Aramco intends to cut seismic acquisition costs by 50 per cent and acquisition time by a factor of four while improving subsurface image fidelity and accuracy at the same time. With the growth of its exploration programme – and its subsequent activities such as data collection, analysis, storage, and preservation – the need arose to create a computer system to track the decisions in support of drilling wildcat and delineation wells and prioritise them based on their benefits and the value of the information derived. The new Exploration Explorer System, launched in 2014, has transformed the way Saudi Aramco deals with oil and gas prospects. It provides a state-of-the-art method to track the phases of decision making. The system also displays the prospective resources, their types, volumes, locations, and depths in a manner that gives its exploration teams a unified vision of the project. Use of the system saves time, effort, and resources while allowing geologists, geophysicists, and all other exploration support personnel to carry out their roles in a more timely and accurate manner. Unconventional gas has transformed the petroleum industry landscape. The company’s own unconventional gas programme continued to gain momentum in 2014. A sizeable investment in this alternative resource will help it assess, develop, and produce gas from shale and tight sand formations in three target areas: northern Saudi Aramco, the greater Ghawar area, and the eastern Jafurah Basin. In northern Saudi Arabia, gas will be delivered to Ma’aden facilities at Wa’ad Al Shamaal by 2016 and by 2018 additional gas will be made available for local power generation. In the greater Ghawar area, work is progressing at the Harmaliyah development pilot to obtain technical and operational knowledge and exploration and appraisal work is also ongoing to extend the reservoir base. Fracture stimulation results in the Jafurah Basin have confirmed the presence of an unconventional hydrocarbon resource. These unconventional gas resources have the potential to complement future inkingdom gas supply, support efforts to displace the use of liquid hydrocarbons for power generation, and increase available feedstock for the growing electric power and chemical industries. As a desert nation, Saudi Arabia is ever mindful of the value of water. Saudi Aramco constantly explores opportunities to minimise water use in the company’s operations, including using treated seawater to replace fresh water. Saudi Aramco commissioned the first successful use of CO2 to replace hydraulic fracturing in a gas well in the Middle East. This development could help it meet its objective of conserving the kingdom’s groundwater for future generations by reducing stimulation water and acid volumes by 30 per cent. In addition, Saudi Aramco has plans to simulate shale gas at the molecular level, modelling the reservoir and its porosity and permeability. This will lead to more effective fracturing, thus reducing costs and improving recovery rates. Unconventional gas is a key component of its goals to help meet the kingdom’s energy needs with cleaner burning natural gas and to create jobs for Saudi citizens. Using natural gas for power generation will also enable it to preserve liquid fuels while efficiently meeting the kingdom’s growing electricity demand or for the production of chemical feedstock, thereby capturing additional value. Saudi Aramco’s oil and gas production infrastructure leads the industry in scale of production, operational reliability and technical advances. The company’s plants and the people who run them make it the world’s largest crude oil exporter, producing roughly one in every eight barrels of the world’s oil supply. Saudi Aramco maintains the world’s largest spare crude oil production capacity, ready to stabilise the global oil market in times of disruption. Ultimately, all in Saudi Aramco know it is not just about how much it produces; it is how the firm does it and what it does with it that matter the most. Inherent in its energy resources is the potential to create products and industries to diversify the kingdom’s economy and generate high-quality jobs. In its hands, energy is opportunity. Successfully put into initial production in April 2013, its Manifa crude oil increment was approaching its full production capacity of 900,000 bpd of Arabian Heavy crude oil at the end of 2014. Manifa will also produce associated gas as feedstock for industrial cities to help fuel economic diversification. In 2014, Saudi Aramco brought its first combined cycle power generation system online at Manifa, making the facility self-sufficient in power. The system uses a turbine driven by steam produced from a waste-gas heat recovery steam generator. A Unesco Environmental Responsibility Award nominee, the Manifa project’s innovative engineering design was created to optimise the field’s production capacity while caring for the environment. Saudi Aramco constructed 3 km of bridges, spanning the migration paths of various marine species to maintain natural water flow and preserve marine nurseries. 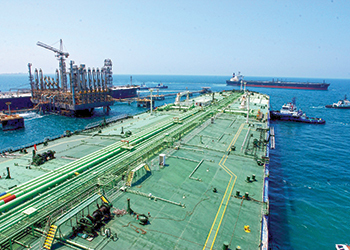 Saudi Aramco was able to protect the marine environment, and at the same time, recover petroleum energy safely and reliably, thereby sustaining both vital resources for generations to come. The historic Dammam field was the first field Saudi Aramco developed, beginning in March 1938 when Dammam Well Number 7 (known as the Prosperity Well) struck commercial quantities of crude oil. The field was subsequently mothballed in the 1980s during a time of low global demand. With current energy forecasts indicating a growing longterm demand for oil, Saudi Aramco has drilled three long-reach wells as part of its plan to reactivate the Dammam field in a phased manner. 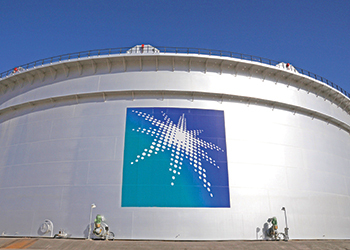 Saudi Aramco continued work on two major projects at the Shaybah field in 2014. First, Saudi Aramco is raising oil production capacity by 250,000 bpd for the second time, bringing total oil production capacity to 1 mbpd of Arabian Extra Light crude oil by April 2016 – double its original capacity when it came online in 1998. Saudi Aramco is optimising well designs that maximise reservoir contact to 10 km, enhancing production and recovery from deeper and tighter sections of the reservoir. Second, during 2014, major construction of the new NGL (natural gas liquids) recovery plant was 96 per cent complete. The NGL facilities are expected to help Aramco meet increasing demand for petrochemical feedstock by recovering valuable NGL from produced gas. NGL production is projected to begin in the second quarter of 2015. The project also includes a major upgrade to increase the plant’s power generation capacity to more than 1 gigawatt by installing four cogeneration units, seven simple-cycle units, and a 50-km, 230- kilovolt transmission line. By July 2017, after the introduction of two steam turbine generators, the total power generation capacity at Shaybah will exceed 1.3 gigawatts. Natural gas is a critical component of its strategies to help reduce the kingdom’s reliance on liquid fuel for power generation and to provide the foundation for further economic growth and diversification. The year 2014 also witnessed major progress in its ability to expand natural gas production with the construction of its Wasit Gas Plant, one of the largest nonassociated gas plants Saudi Aramco has ever built. At year-end, construction was 91 per cent complete and the plant is scheduled for start-up in 2015. At full capacity, Wasit’s integrated facilities will process 2.5 bscfd of nonassociated gas from offshore fields. The plant also includes one fractionation module designed to process 240,000 bpd of NGL. The cogeneration facility at the plant, also scheduled to start up in 2015, will have the capacity to generate 750 megawatts of electricity, making the plant self-sufficient in power with the excess delivered to other company facilities. Most of the Wasit Programme required innovative project execution strategies. Saudi Aramco deployed its Event Solution Centre to accelerate the project development cycle by bringing together multidisciplinary experts. This integrated model drives new work processes and technologies to produce assessments that give its managers increased clarity and the ability to achieve significant cost and schedule savings. One outcome of this approach was the deployment of "big bore" well completions. These high-capacity wells are capable of producing at very high rates. This tactic significantly reduced the production cost and provides greater production flexibility to meet demand. The Midyan Gas Plant in the Tabuk region is its first such project in the kingdom’s northwest. 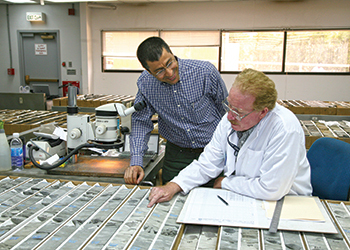 The Midyan field, discovered in the early 1990s during Red Sea coastal plain exploration, was studied to identify ways to optimise economic production. Work on the plant commenced in 2013 and the facility is scheduled to be fully operational by the end of 2016. Midyan is designed to produce and process 75 million scfd of nonassociated gas and 4,500 bpd of condensate. At year-end 2014, engineering for the gas processing facility was 93 per cent complete while procurement and construction activities reached 62 per cent and 8 per cent complete, respectively. The Midyan project will include the establishment of two pipelines stretching 98 km to deliver sales gas and stabilised hydrocarbon liquids to the Saudi Electricity Company’s high-efficiency solar thermal power plant near Duba to generate electricity. The feed from Midyan to the plant will displace the use of high-value diesel. In its early phase, the Fadhili Gas Plant will process 2.5 bscfd from onshore and offshore fields and is on track to come on-stream by 2019. Drilling for nonassociated gas to supply the plant commenced in 2014 and Saudi Aramco issued the final project proposal in preparation for the detailed design phase during 2015. Together, its Wasit, Midyan, and Fadhili gas plants will add more than 5 bscfd of nonassociated gas processing capacity, further enabling opportunities in Saudi industries such as steel, aluminum, and petrochemicals; water desalination plants; electricity production; and downstream value-added industries to produce antifreeze, solvent, fuels, and other advanced materials. The company’s operations take place across a range of operating environments and span great distances. To help Aramco manage its resources from the wellhead to the customer, Saudi Aramco relies on a wide variety of support services from organisations throughout the company. For example, its new marine logistics operational model reduced rig turnaround time by 65 per cent, driving down costs and raising efficiency. The company’s Marine organisation also procured 16 new platform support vessels, improving the flow of materials and supplies to drilling platforms in the offshore Manifa field.